Gustave Caillebotte used his financial resources to become one of the main patrons of the Impressionists. 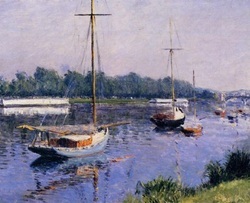 During his youth, Caillebotte lived in Yerres and Paris. Some of his paintings depicted these homes. After serving in the Garde Nationale Mobile de la Seine during the Franco-Prussian War, Caillebotte began to visit Salon painter Leon Bonnat's studio. Following his first submitted painting to the Salon's rejection, he joined Renoir and Henri Rouart so he could take part in the second Impressionist exhibition of 1876. In 1877, during the third Impressionist exhibition, Caillebotte exhibited five of his own paintings. One of these works was The Pont de L'Europe. This piece showed the Impressionists' concern for displaying contemporary urban life. However, his artwork did not necessarily have the loose brushwork that most of his fellow Impressionists preferred. 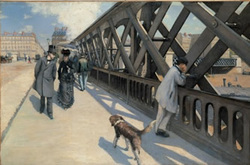 Caillebotte's paintings in the fourth Impressionist exhibition of 1879 showed a transformation to a certain degree. They were beginning to contain loose brushwork and brighter colors. 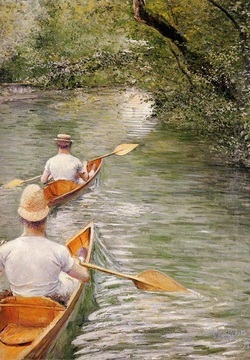 Many Impressionists, including Caillebotte, depicted a popular activity, boating, in their works. Along with other artists, Caillebotte did not participate in the sixth Impressionist exhibition in 1881. In addition to his artwork, he began designing his own sailboat in 1882. He rejoined the Impressionists in 1882 after acquiring property on the banks of the Seine and took part in their seventh exhibition. The paintings he contributed in this exhibition displayed Caillebotte's wide variety of interests such as the boulevard, bourgeois interiors, the flaneur, still lifes, and seaside scenes.